I don’t think I’ve heard of her blog before! Thanks for sharing, Asa. Off to check her out. OH MY GOSH Asa! I am so flattered! Thank you SO much for featuring me! This truly means the world. So lucky to have you following along–thank you so much for the support! You’re so welcome! I’m glad that you liked the feature. I appreciate you stopping by and leaving a comment. It means so much to me that you took the time. I am going to check her out now as well! I felt exactly the same as you when I first started a blog- extremely nervous as to what people would say/think and was hesitant to share with friends and family. One of the benefits to blogging is that you really learn to find your voice and not worry so much about what others think! Have a nice weekend, Asa. I totally agree with you Cami. You do learn to find your voice and confidence with blogging. I am glad that I am not the only one who was scared when they started. Definitely check out her blog. Have a nice weekend as well! I was nervous too. But I finally shared on blog on facebook and Tumblr and have only had good responses. I will say that I didn’t get as many comments and followers from it as I’d liked, but I definitely get more views. I’ve set it up so that every time I post, it shows up on my facebook feed and tweets the link. I don’t actually use twitter for anything other than promoting my blog. That’s awesome Adrienne. I appreciate you sharing. It’s so good to know that I am not alone. I’m glad you have only experienced good responses. That has been my experience as well. I’m still surprised by that. Scheduling social media is the way to go. Have you ever checked out Hootsuite? It’s great for scheduling all your social media in one platform. I’m definitely going to check out her blog! I love the fact that she responded, Asa! Love her blog, thank you for recommending! 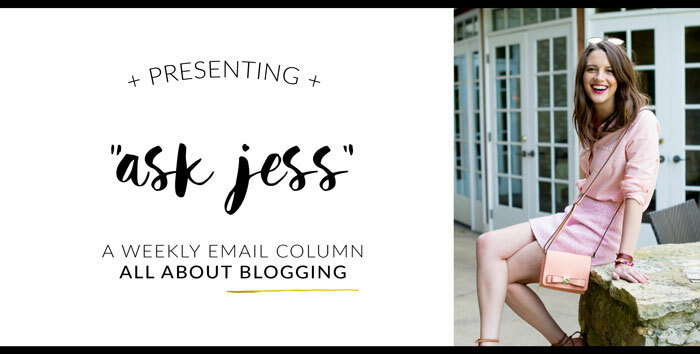 And I’m so glad that you have a “blog” IG now – love following you! Love her style!Thanks for sharing! Oh yay, another fan! She is so great. I haven’t heard of her before but it looks like I need to read her articles too! Thanks for sharing so many great blogging resources! It’s the first time I heard of this blog and I will look into it! Thanks for sharing! What a great resource! Thanks for sharing this with us, great post! So pretty. Such a lovely bag!